"The cards arrived in plenty of time and they look great. As usual, wonderful service, quick turnaround, and great prices. Thank you!" So, you want a plastic business card that is more than simply durable, it's memorable. We have you covered! Clear plastic business cards are much different than our standard business cards - and are gaining popularity because they offer dynamic, eye-popping originality. The trendy, see-through element gives them a modern touch. Clear cards can incorporate a number of design elements, from frosting to partial full color printing; they are perfect for businesses and individuals looking for that competitive edge. A conversation starter, these cards are not going in the trash any time soon. Clear business cards offer tactile interest with their smooth or raised surface textures. Transparent cards offer visual interest and are more likely to be kept as an item of interest. Plastic cards, including clear, are far more durable than even the strongest traditional business card. Clear cards can be printed with full color process on partial areas providing many creative design options. Available in the standard clear plastic or a matte plastic, slightly more opaque finish. The clear plastic can also be embossed, foil stamped, and shaped to offer even more unique elements. Varying thicknesses are available for our clear business card products. The standards are 20 or 30 mil. Transparent plastic is a designer's dream, providing endless special effect options. PrintingForLess.com is all about making your business grow and supporting your success through the best print products and support service on the market. 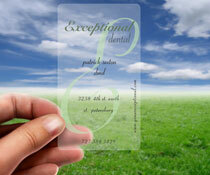 Give us a call at 800-­930-2423 for a professional, no obligation consultation on your clear business card project. We also offer an online plastic card template download that can help you begin the design process. If you need professional design, we have a fabulous in-house team of experienced graphic designers who can assist you for a very reasonable fee. Translucent business cards don't have to be utilized for traditional business purposes alone. Consider clear plastic cards for your rewards program, VIP tickets, or loyalty cards. The trendy cards engage customers and are a conversational item, helping you leverage word-of-mouth marketing. People enjoy sharing things that are unique. Why not put your branding into the hands of your best advertising channel, your current customer base? Armed with an attractive and unusual clear plastic card, it will be natural for them to show it to friends and family. We can incorporate foiled scratch-offs, QR Codes, magnetic stripes, or signature blocks if you want to increase customer interaction with your custom clear card. In this competitive economy, investing in clear plastic business cards is a good move. Improving your impact in small ways can go a long way in keeping you top-of-mind in the marketplace. You know your business, and we know ours. Let us bring our collective, 900 plus years commercial printing experience to help you get the clear cards you envision. Our clear business cards are competitively priced. Get a quote on custom options.